Having rigorous quality controls (QC) with high standards does not guarantee absolute satisfaction of the customer. This is why SiliCycle created a Quality Assurance department with a clear goal: always improve our process, maintain and improve customers’ satisfaction. To honor this goal, we now base our quality management system (QMS) on the ISO standard. On October 31, 2007, SiliCycle was proud to announce that it was registered to the well known standard of quality: ISO 9001:2000. In October 2009, the registration under the new version ISO 9001:2008 has been accomplished without any non-conformity. 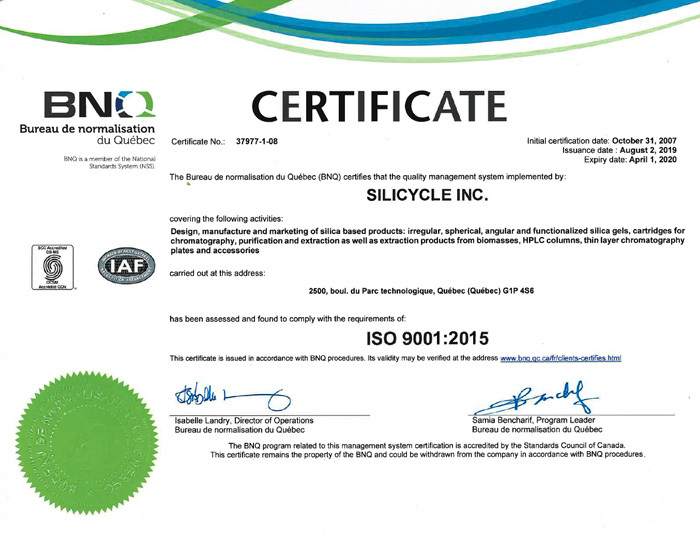 In May 2018, SiliCycle registered to the ISO 9001:2015 standard of quality. Thus, this registration shows that we continually improve the effectiveness of our quality management system; we follow our policies and fulfill our objectives which lead to customer satisfaction. If you like to know more about our quality management system, please contact us.